Your beloved Buccaneers have been outscored 74-21 in their last two Week 2 games — both on the road and both on the heels of big opening day wins against second-rate quarterbacks. Have the Bucs learned their lesson? Have they figured out how to be mature winners? 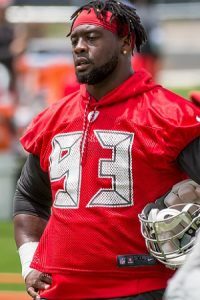 Bucs captain and Pro Bowler Gerald McCoy has a pattern Joe has noticed through the years. He typically parrots to media the exact message he’s hearing from coaches. McCoy doesn’t come right out and say the “coaches are telling us this,” but it’s what McCoy typically does. So how is Dirk Koetter trying to get the Bucs’ mind right entering into Sunday’s game after whoopin’ the Saints four days ago? It seems McCoy told SiriusXM Mad Dog Radio host Adam Schein that this afternoon during Schein On Sports. So there you go. Be mature. Act like champions. Joe thinks it’s great that the Bucs have the defending Super Bowl champs this week. If the Bucs can’t get up for that during their home opener, well, then they have serious issues. There’s zero excuse for a letdown. McCoy continued his message about “what great teams do,” which Joe is sure has been a theme at One Buc Palace this week. Gonna be a tough game, but the Bucs win versus the Eagles at home, even if the team is overmatched. Take 2006, the game where Ronde Barber single handedly beat the Eagles by himself, the Bucs were a 4-12 team under Gruden and beat the Eagles who would go 10-6. Fun fact: The offensive genius that was Gruden, who destroyed the defense in order to sign a bunch of old washed up offensive players in 2004 after he got Rich McKay fired, anyways that Gruden got the Bucs 211 points in 2006, or 13 points a game. Nick foles will throw for over 300 yards, three tds with above a 70% completion percentage. This is a backup an with crap weapons compared to drew brees. Everyone has been saying.no excuses no excuse but we.keep hearing excuses. NO EXCUSES FOR THE DEFENSE TO LOSE THE TIME OF POSESSION TO A LESS THAN AVERAGE OFFENSE! Koetter, could build an offense of undrafted free agents and put 30 plus on smith. I like what’s coming out of GMC’s mouth. Move on quickly after you celebrate the victory. Next opponent up is the focus. We don’t need to go back to Raheem and fun bunch celebrating like a fraternity house after a mixer! They were actually outscored 74-24. Splitting hairs but…. Lost to Vikings 34-17 in 2017 and lost to Cardinals 40-7 in 2016. Eyes are on the defense this week. Yes, Nick Foles took his team on a run and won a SuperBowl. That dude played great and deserves a ton of credit. But the fact is that Nick Foles is struggling right now. Don’t underestimate the guy but our defense needs to be geared up to take advantage of a stuggling offense/QB. Nick Foles is not so hot under pressure. It will be a task to get past his line and get to him but if we do that we will beat them. Another area to focus on this week is special teams. Philly makes a lot of mistakes on ST and if we’re hungry we can capotilize……There coach is also pretty weak at managing the clock so I expect Dirk to outcoach him there and get our offense an extra chance or two. Please make sure our FG unit knows how to get onto the field this time. How much fun would it be if we don’t have to hear the term den of depression this year? I’ve walked out of Raymond James Stadium absolutely dejected so many times it makes me sick to think about it. You’re the same type of negative nancys that were saying the Bucs had no chance what so ever to beat the Saints. You make me feel lucky. What a difference in attitude since loser lovie smith was here only a short 3 seasons ago!!!! Remember back then!!!! The D-line threw a dance party in the locker room after wins and especially losses!!!!!!!!!!! Glad to see “real” coaches changing the culture here in Buc land!!!!!!!!!!!!!! #trust the coaches!!!!!!! Fix the “real” problem!!!!!!! the roster!!!!!!!!!!!!!!! @BucEmUp … “NO EXCUSES FOR THE DEFENSE TO LOSE THE TIME OF POSESSION TO A LESS THAN AVERAGE OFFENSE!” Still shouting I see. TOP is won by BOTH the defense & the offense. We had about a 2 minute advantage on the Saints Sunday. Defense also added 2 turnovers. By taking the ball away from the Saints’ offense, and giving it back to our offense, don’t you think BucEmUp that that MAYBE had an influence on the TOP? Plus, quite a few of the Bucs scores weren’t from ‘grind em out’ drives (most were quick strike as I remember). Foles has played the Bucs twice, has 7 TDs and 0 INTs and avg about 320 yards. Why is Koetter allowing these little wins they get go to there heads so easily. He just seems to not know how to instill discipline in his team. By just letting stuff happen a not addressing situation. Like why was Fatty Baker not riding the bench or even Jameis for that matter for being undisciplined. Its all on the coach. Why is Koetter allowing these little wins they get go to there heads so easily. Because he’s so Super Excited to get a win too!! Pardon the snark. Maybe if he continues to let Funken Monken handle the offense,and actually gives him credit for it, DK can graduate up into a Head Coach. First order of business should be to get all up in the Defense. Hang out in there meeting rooms. Stop hanging around the QB room being all jealous that they like Todd better.. Straighten some sh!t out with Smitty and Maxie. And definitely whoever is the LB coach. Be present to the D players. Run the WHOLE team Dirk. I bet Vinny Curry and Beau Allen got a “Tampa Special” cooking for Foles. We have some really negative fans here. If all you’re going to do is complain about what MIGHT happen, and focus on worst case scenario, what’s the point in even following the team? Being a sports fan is about being a FAN. Fans are optimistic about their teams. Yes, we understand where our weaknesses are. That doesn’t mean it needs to be the focal point, or that you should have a defeatist attitude before the first snap of any game in which we play a talented team. Support the team, stop being so damned negative, and HAVE SOME FUN doing it!